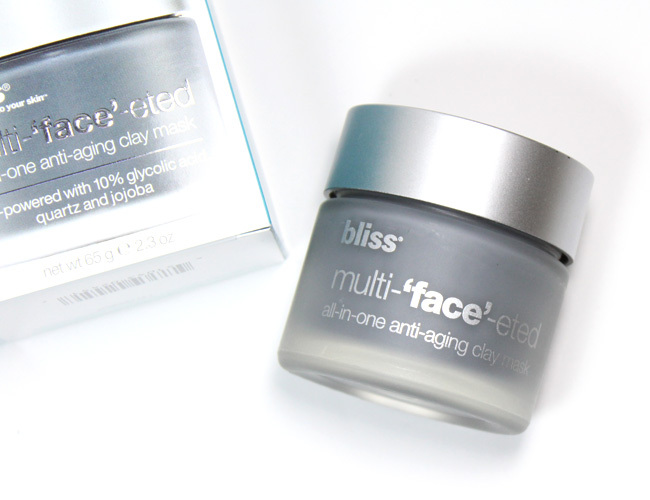 bliss multi-'face'-eted All-In-One Anti-Aging Clay Mask. It's very obvious that I am all about anti-aging here. We all are. Unfortunately, we are aging every second of every day. It's a fact. Masks are a vital part of any anti-aging routine. And masks are a vital part of my relaxing Sunday night spa night. I have stayed away from clay masks in the past because they can be drying and my skin is already dry. The last thing I need is for my skin to be more dry and tight. Well, my friends at bliss have created multi-'face'-eted All-In-One Anti-Aging Clay Mask and it's totally face friendly - it's flexible! The bliss All-In-One multi-'face'-eted All-In-One Anti-Aging Clay Mask is the only flexible clay mask that helps correct all six signs of aging. It contains things like smoothing quartz, 10% glycolic acid, kojic acid, kaolin, nourishing jojoba oil and detoxifying carbon. So what does this flexible clay mask do? Well it helps to reduce the look of fine lines and wrinkles, fade the look of dark spots, unclog pores and brightens skin all while moisturizing it. My skin is left feeling velvety soft. I love that I can wiggle my nose, talk and simply move my face around while I'm wearing the mask. I leave it on for about 5 minutes before removing with a wet washcloth. bliss All-In-One multi-'face'-eted All-In-One Anti-Aging Clay Mask sells for $50.00 and is available at bliss spas, blissworld.com, Sephora and Ulta.